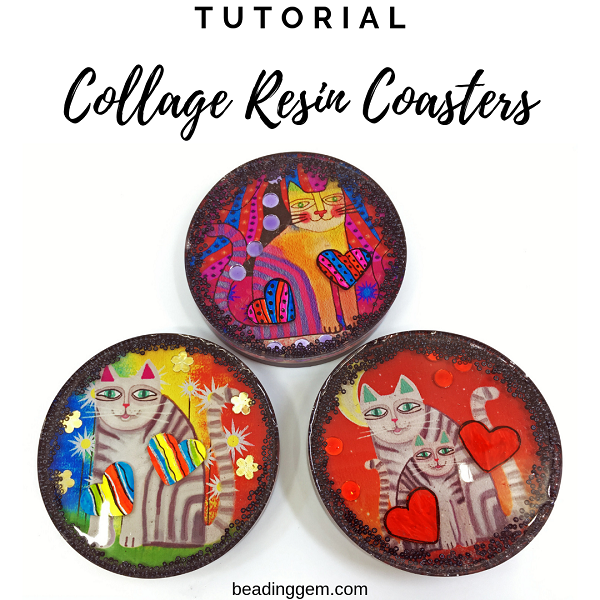 Making resin coasters is just one way to scale up jewelry making techniques! You can tell I have fun making them as here is another one. 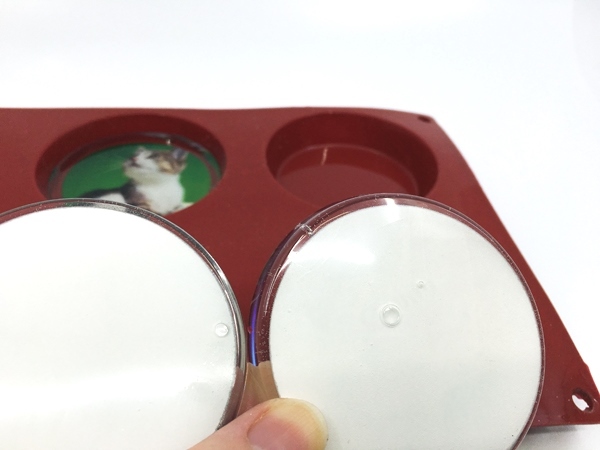 This time, I wanted to see if I could embed different things in the resin. Coasters offer more opportunities to add more things! I also wanted to see how working with larger ink jet photo paper will turn out. It wasn't plain sailing but I learned some more about resin. I am no graphic designer so I thought it best to get help from someone who does this well. Margy Young of Kergie Creations has wonderful colorful designs. She covers a wide range of subjects but her cats, dogs, and nature ones were my favorites. 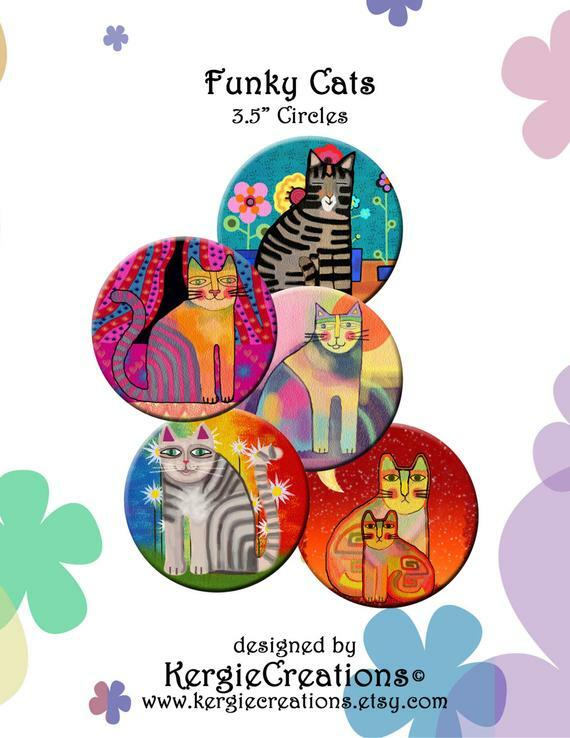 I finally bought her Funky Cats design which comes in several sizes and shapes. 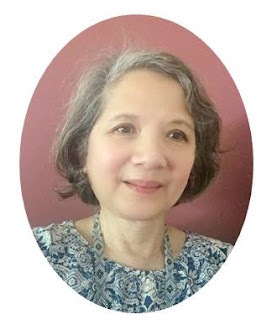 Her images are versatile as she sizes them for various crafts such as jewelry making, decoupage and scrapbooking. 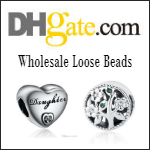 See the links at the end for specifically jewelry tutorials. 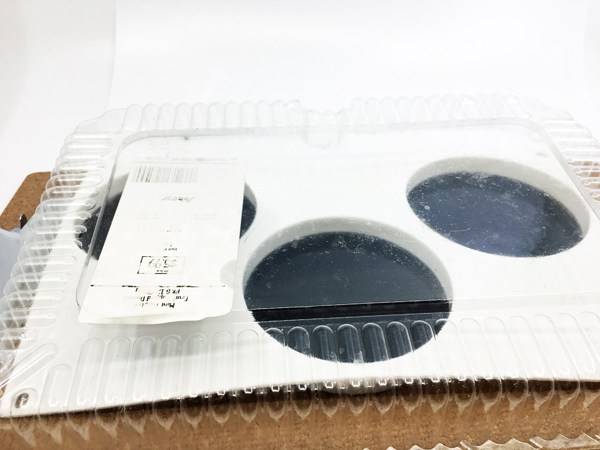 I chose the 3.5 inch ones to fit the round resin molds I had for making coasters. (See my past resin coaster post which uses seashells and sea glass for more details) This downloadable image pack came with 12 different designs which can be printed out in sets of 3. I had to pick just 4 designs - one of which is a spare. Choices, choices. These are quite big so I could not fit all 4 on a single page. As these are digital images, I could select the ones I wanted in pairs and arranged them on 2 new pages on my computer. I uploaded the two new image pages to my Cricut electronic cutter and used that to cut them out. 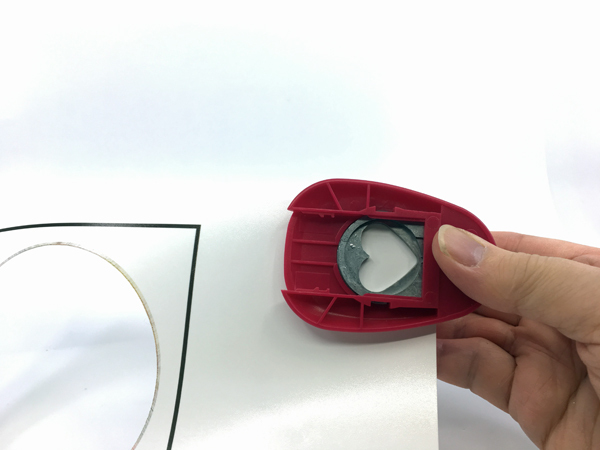 With the Cricut, once you upload images, you can size them which I did to make them better fit the molds. 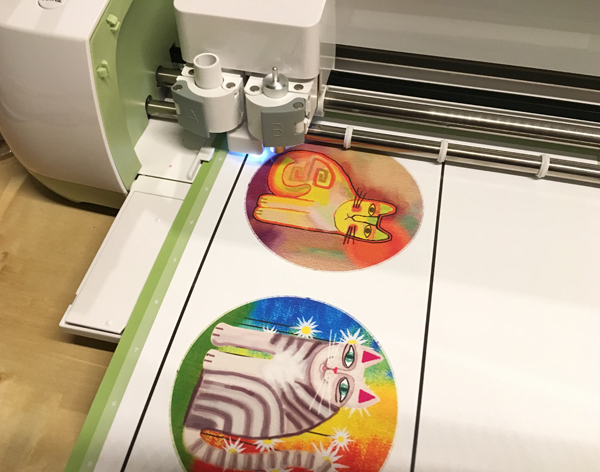 Alternatively, you can just print out the images and use scissors to cut and trim to size. 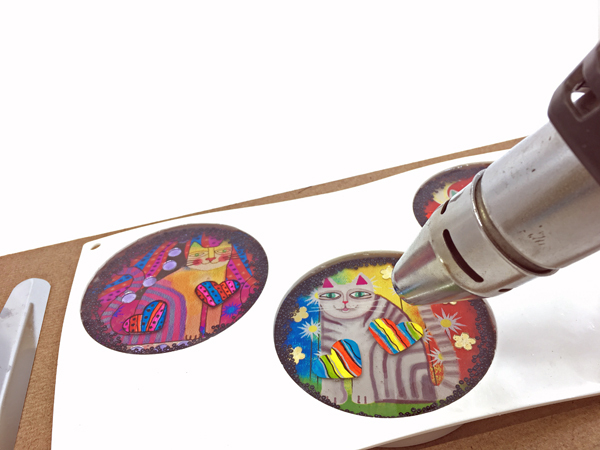 If you are making smaller projects like pendants, you can use paper punches for precision cutting. I printed using Little Windows 8 1/2 " x 11" Photo Paper which works well for resin. 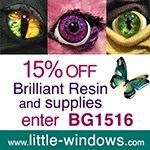 (15% Discount code for readers : BG1516) I have tried other makes as well - there is a difference. 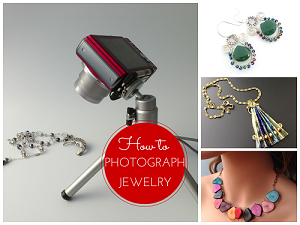 See my past tutorial on photo resin jewelry which compares photo paper and also different makes of inkjet printers. 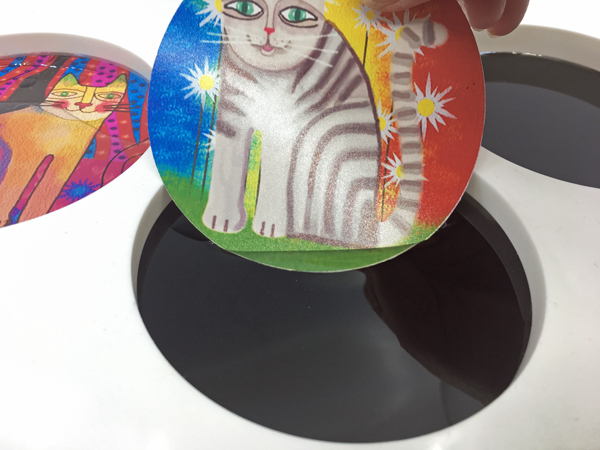 Here is the big tip about photo paper - there is no need to seal such images before putting them into resin. 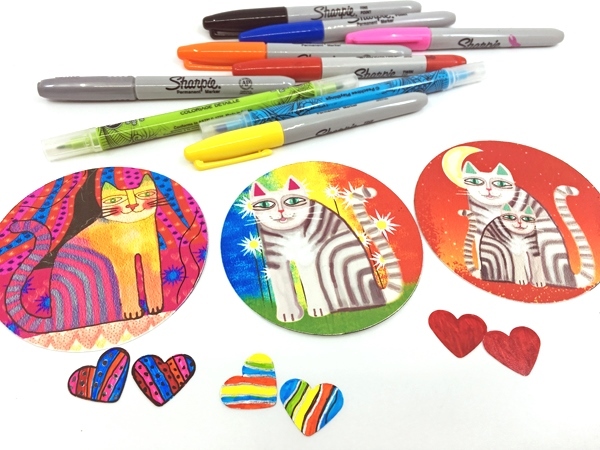 Regular paper or card will turn translucent so these have to sealed with Mod Podge. Another tip is not to discard the leftover paper - you will see what I did with it. I used Little Windows' Brilliant Resin and worked in layers. This resin is made up 2:1. In hindsight, the first layer could have been thinner so rather than 100 mL to 50 mL, I suggest going half that amount if you are using the same mold as I am. I do use the cups that come with Brilliant Resin for smaller projects but I have switched to reusable silicone cups for larger quantities. 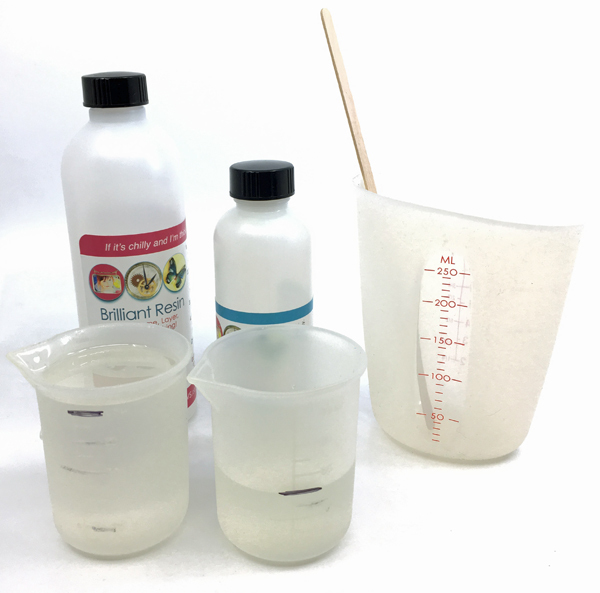 I got 2 x 100 mL and 1 250 mL for mixing. 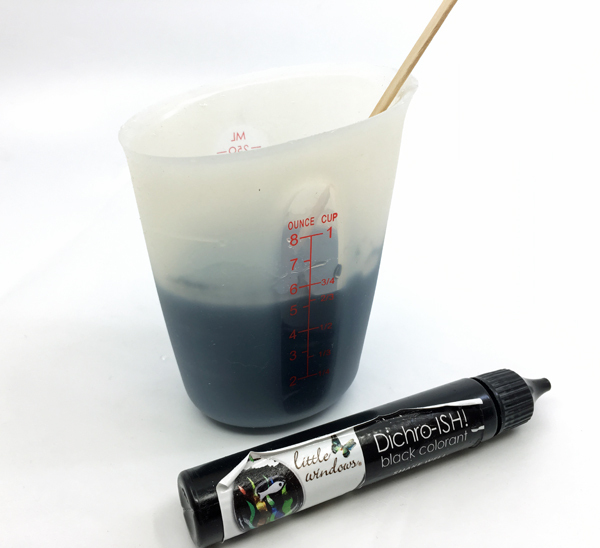 These are easy to clean - check my tutorial on how to clean and remove stuck resin leftovers. Heat up Part A for 6-7 seconds before mixing with Part B. This slight warming helps reduce bubble formation without accelerating the polymeric reaction too much. Here is what happens if you overdo it. I heated Part A to 15 seconds. 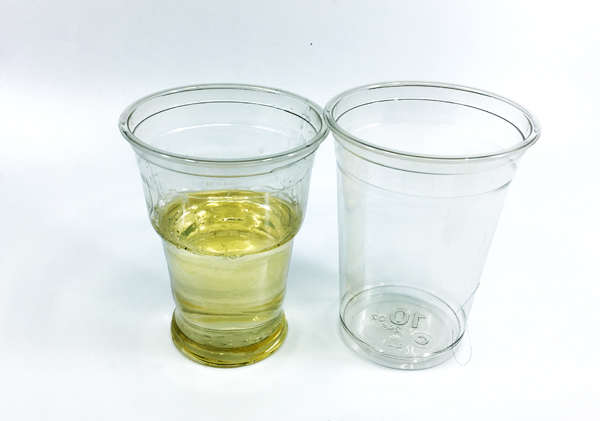 Once I mixed the two parts together into a disposable cup, the mix got very hot and the plastic cup shrank as shown in the comparison photo below! Moreover the cured resin is discolored. The extra heating apparently accelerated the aging of the resin! 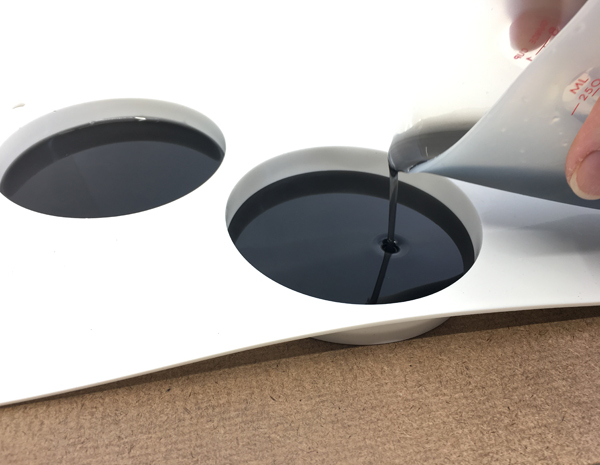 I used Little Windows' black resin colorant for the first layer. I added at least 10 drops. Still looked a bit watery to me at this stage but it did go black once cured. I put the mold on a clipboard before pouring in the first layer. The clipboard makes it easy to move the mold. Always cover curing resin which takes overnight. This prevents dust on settling on the work. I like to use recycled supermarket product covers which allows me to keep an eye on the work in progress. 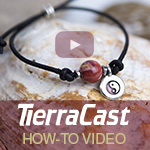 Why did I not just use clear resin as I did with this pendant and earrings tutorial? 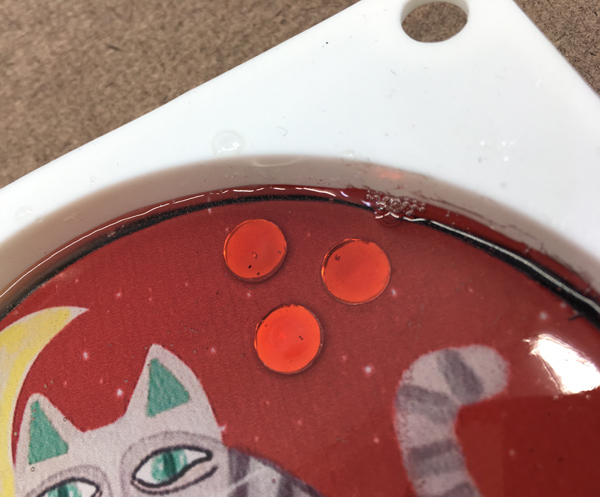 I discovered a bubble issue when I tried making smaller round resin Christmas ornaments featuring my cats. Larger surface areas like this means bubbles could get trapped and not be seen until you turn the work over! So adding an opaque layer below will hide this. This project turned out to be also about cats. I love cats. So cue in the hearts! 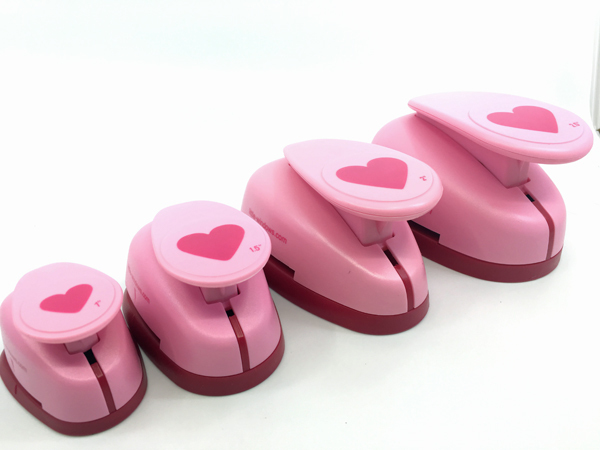 I previously received the heart paper punches from Little Windows. I used the smallest one for this project. I did not want to throw away the leftover photo paper after printing. So I cut several hearts out. I had fun coloring these little hearts using permanent markers. Once the first black layer was cured, I did a dry run. 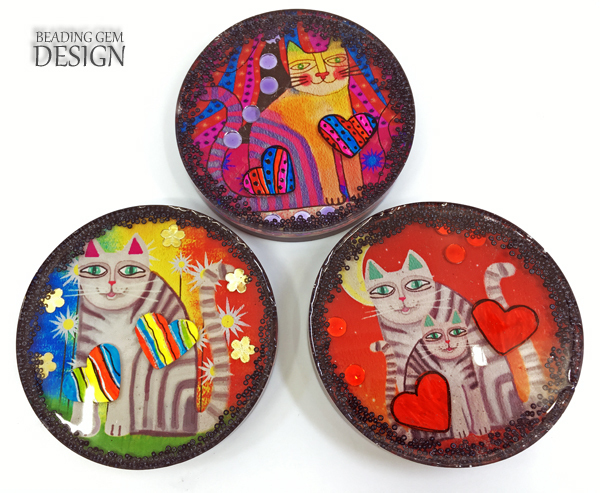 I placed the cat images into the molds and experimented on where I wanted the hearts to go. I also added some inexpensive rhinestone shapes which I got from the dollar store. Once I had the design plan done, it was time to add another layer of clear resin. Then I slipped the images sideways. The best thing is to do just that and NOT press the images firmly down and over manipulate them. The trick is to let any bubbles that do form underneath to remain there. I added the hearts and rhinestones as planned and made sure everything was submerged in resin. As mentioned above, I learned the hard way why it is best to leave some resin in between the image and the cured black layer. The bubbles will remain underneath. 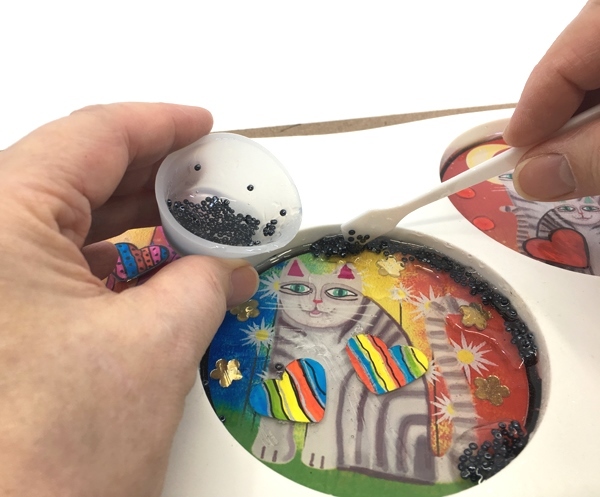 But as I had pressed images down hard, the bubbles now had nowhere to go but to the edge, continually burping at the edges right through curing despite me trying to get rid of them while the resin was still soft. How did I fix this? I added a third layer of resin and incorporated little black seeds beads at the edges to hide those bubbles! 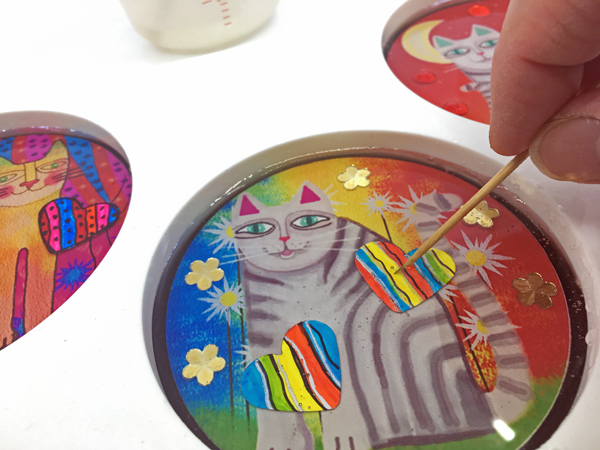 (Tip, add beads to resin first to reduce bubbles in the holes!) 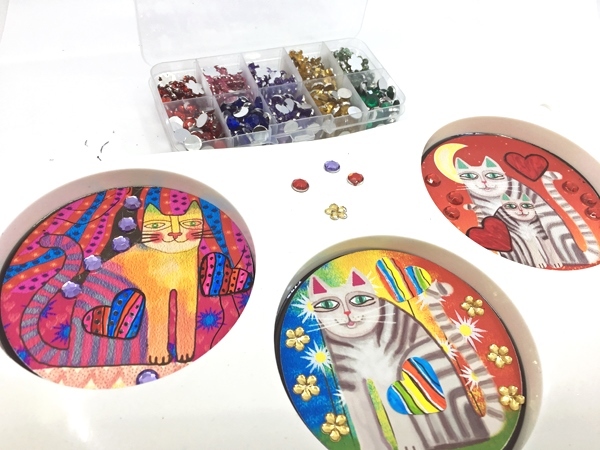 Those little silicon cups are wonderful also for beading purposes. I also tried using a hot air gun to dispel surface bubbles. Works to a limited extent. Using a torch or a hot air gun cannot get rid of deeper bubbles. So use a toothpick to coax the miscreants out. 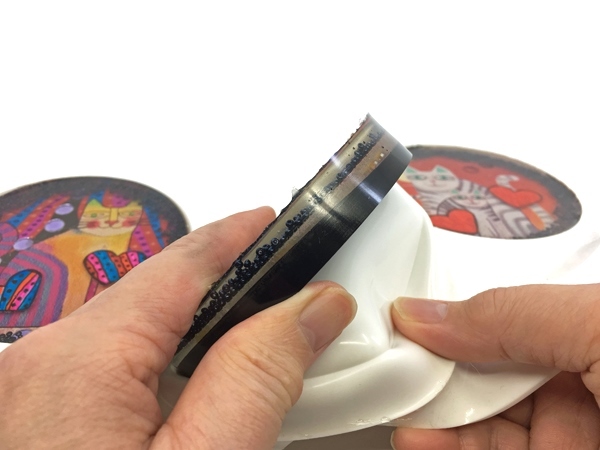 Removing the cured resin coaster is a breeze. 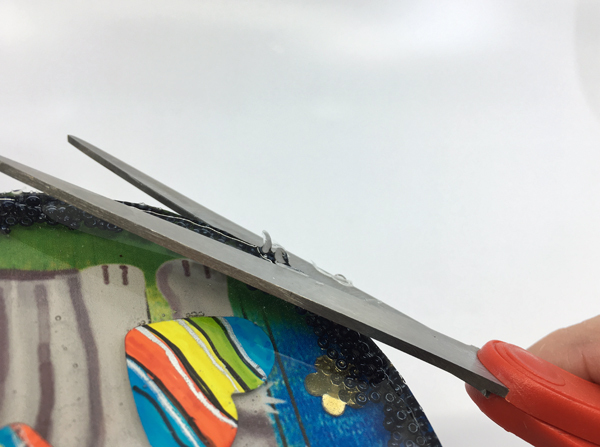 There were some rough edges - the longer pieces can just be trimmed off with scissors. This will cut down the sanding time. You can't see the clear plastic container below but I did sand the rims smooth underwater. I used 400 and 600 grit wet and dry sandpaper. I probably will give it another go with 800 grit. Glad you spotted that as I forgot to mention it in the post. 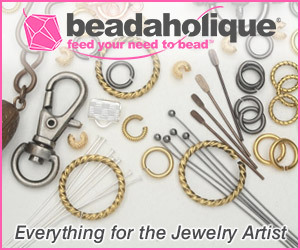 I have shared that tip before with a reader who asked about including beads in resin. 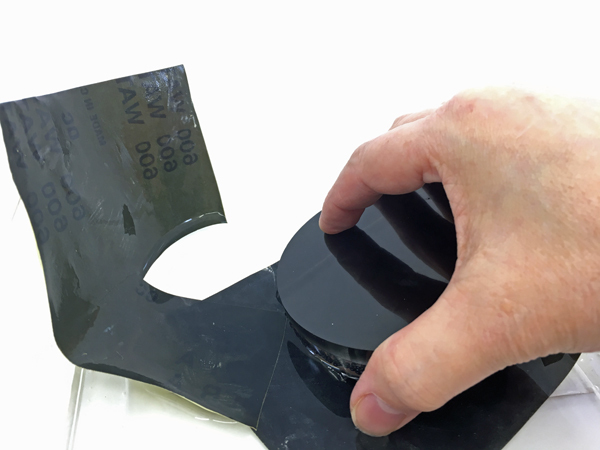 That is a great alternative to solving the problem of bubbles at the edges! I use the hot gun from a distance which does not cause large ripples. But as I said above, it doesn't work for deep resin work. 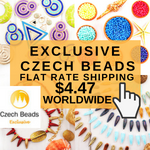 So Laurel Burch! I LOVE them!! How I wish....maybe if we have a super warm summer? You might want to try working with resin maybe in a warmer part of your house! Great tutorial! Very thorough and detailed. Love the inclusions, especially the seed beads along the edges to disguise bubbles. Thanks for sharing this Pearl! Thanks Gloria! I wasn't sure about the seed beads but they were necessary to hide the bubbles!